LaBellaVida: Current Top 10 Dress Picks! I am in love with every single dress in every shop i see these days (as usual) so i thought i would pick my current top 10 and share them with you! 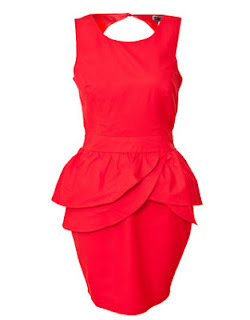 I picked Lipsy peplum dress as my No 1 because red is currently my favorite clothing colour for A/W and i think it goes well with my skin tone and dark hair. This dress would go perfectly with a pair of plain black heels as the dress is bright enough, and enough of a statement, that understated shoes would really compliment it. I am absolutely in love with all of these dresses and would buy every single one of them if i had the money to! Also if you can't tell already, i am completely obsessed with peplum, mesh and sequins..... i can't help myself! Do you like or have any of these? What are your current favorite dress styles? OMG! All perfect i just can't pick one! Arrgh want them all! I love them all too, not good for my bank balance!! Oh wow the red lipsy dress shown last is absolutely drop dead gorgeous (in love).